The way we work is changing. Today’s workplace is a challenging environment for teamwork, Your teams need a simple, reliable way to connect, collaborate and get work done – wherever their business takes them. Microsoft Teams solves for multiple communication channels, disparate collaboration tools, and a remote workforce by being the hub for teamwork in Office 365, bringing file sharing, chat, and integrated apps all together in one place. 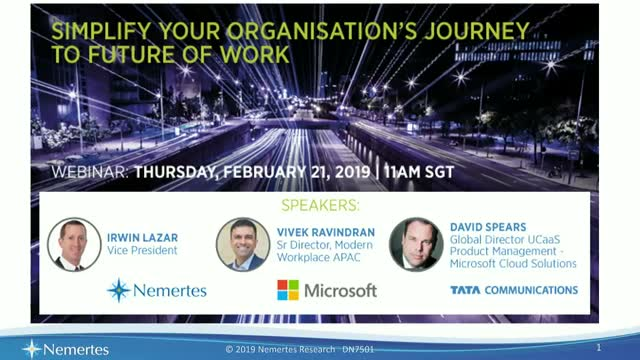 Tata Communications, in association with Microsoft would like to invite you to a webinar by Irwin Lazar, VP at Nemertes Research, to discover how you can successfully implement Microsoft Teams for your organisation and unlock its full potential regardless of where your employees or partners may be.